Sometimes Big Dumpster Rental In Moline, Illinois Can Be Too Much! Not enough junk to justify ordering a large metal bin. If you just have a sectional couch to be disposed of, you wouldn’t want to have a big expensive metal container delivered to your Moline, Il home. And speaking of that sectional couch, some folks don’t wasn’t to load heavy or bulky items into a dumpster. Sometimes it’s just easier for folks to pay others to do the heavy lifting. Elderly residents can’t always cart their waste items to the bin or curb, so they pay others to do this dangerous work. Hot tubs, appliances, and other large items sometimes require special demo or remanufacturing prior to being hauled away. Not everybody has a driveway that can be used for equipment placement. Or maybe they can’t afford to have their driveway blocked for an extended period of time. 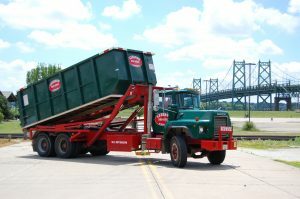 So regardless of your reasons for not renting a small dumpster in Moline, you might wasn’t to contact a local junk removal company, and not waste your time with a 1800 junk removal company which may not be locally based. Moline is a wonderful place, home of the Maroons, John Deere Company, and chocked full of residents who like to keep their homes clean and tidy.. Landrum Disposal wants to be part of enhancing the ambience of this fine city by collection junk and delivering dumpsters.